The side quest section of Majora’s Mask is even bigger than the story section, but that’s what makes Majora’s Mask so much fun to play. It’s unique in that it doesn’t follow with what the set story formula the other Zelda games follow (well I haven’t played the Gameboy and DS Zelda games, but I want to) – princess Zelda or her incarnate or her alternate universe self being caught up in trouble with Ganon or Ganondorf or his alternate universe self. Majora’s Mask follows the game play and dungeon formula set by the other Zelda games, but it takes it even further by introducing the Mask side quest and makes it such a large part of the game – how cool is was filling all those Masks collected with happiness. …The second time I got inside the hideout but I couldn’t remember just what I had to do, and wasted most of my time figuring out that I had to push the stone on the switch with Kafei. By the time I got to the part where Link had to defeat the Wolf, the Sun Mask fell down into Sakon’s possession =(. The third time, I managed to make good time, but when I go to the end, I thought Kafei had to wait by the conveyor belt end thing for the mask to arrive, when nothing happened, I saw the switch and stood on it, but I wasted too much time with Kafei and I didn’t have enough time for Link to run to the other switch in the room =(. The fourth time was just sad…I normally wore the Stone Mask when I was watching Sakon run to the hideout door and open it, but this time I had my Bunny Hood on and oblivious to the fact that such a scripted scene was written into the game, he saw me and ran away not opening the door…ahhhh…it really was sad. Finally the next time I managed to get inside the hideout, make good time to the end and have both Kafei and Link on the switch and save the Sun Mask!!!!!!!! 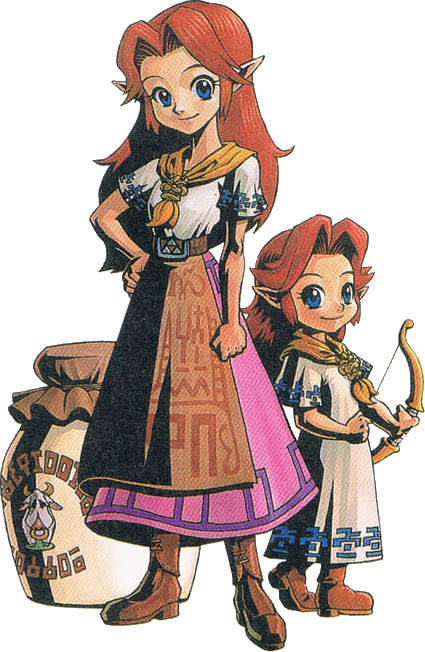 The next part was simply, I just waited for Kafei with Anju in her room back in Clock Town. How touching it was when Kafei came and the two hugged, awww such a sweet conclusion to such an intense ordeal the two endured through. Through everything they still held onto the love they have for one another and believed completely and utterly in each other. 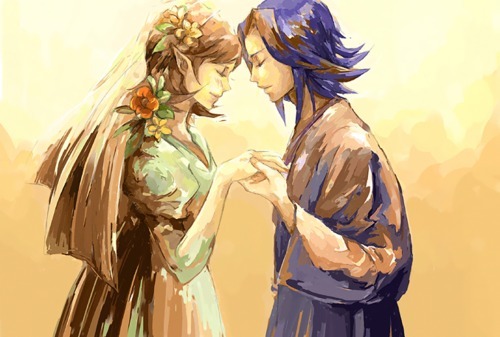 And Link got the Couple’s Mask for the efforts he went through – yay!!! This may have been the hardest side quest for me (it should have been simple, but I probably inflated it into something troublesome with my many errors =P), but it is my favourite =). The last mask I had to get was the All-Night mask – I can’t believe I forgot the Curiosity Shop guy sold it on the third night if you stopped Sakon on night one. Anyway, I got the Fierce Deity Mask and like I expected, Majora was cake to take down – those sword slashes are amazing =). The second time I faced Majora, I wanted more of a challenge and just used normal Link – it was fun as well =P. It would be interesting if there was a Master Quest version of Majora’s Mask – where you lose like 4 hearts if you get hit by Majora =). 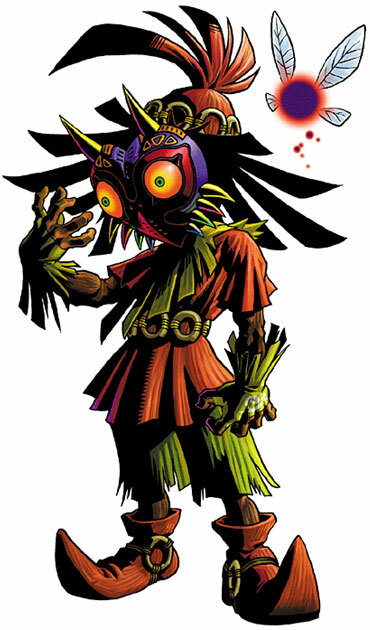 The ending was great, so that Skull Kid was the Skull Kid in Ocarina of Time =D. The Mask salesman is pretty intriguing, I like how he was given that enigmatic aura and animated in that erratic and snappy movements – and his MARIO Mask!!!!!!! Those kids inside the Moon do look like younger versions of that Mask Salesman – I wonder what’s up with those kids. But either way, the inside of the Moon setting was beautiful. 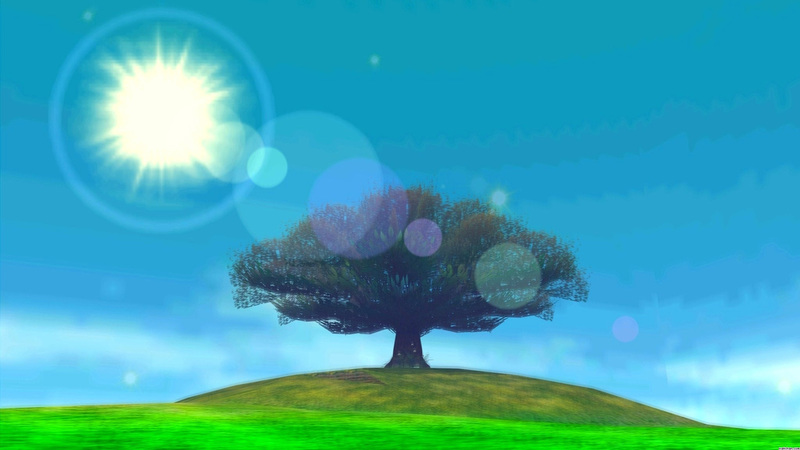 I couldn’t help but think the Garden of Eden and that lone tree in the middle as the Tree of Knowledge. Intriguing how the Majora Mask kid set up the “good vs bad” fight and gave you the Fierce Deity Mask. Majora’s Mask is a great game and I loved playing it again and finding out how much deterioration had affected the memory of my mind, it was amusing – I forgot quite a bit about the side quests in this game =P. Anyhow, will be trying out some of the Gameboy and DS Zelda games soon – Nintendo allowed 3DS users to download Four Swords last month in celebration for Zelda’s 25th anniversary, so I will give that a go soon =). This entry was posted in Games, The Legend of Zelda and tagged Anju, Cremia, Kafei, Link, Majora's Mask, Nintendo, Romani, Termina, The Legend of Zelda, Zelda. Bookmark the permalink.